(Trent Nelson | The Salt Lake Tribune) Brigham Young Cougars defensive back Michael Shelton (18) knocks the ball away from Utah State Aggies wide receiver Andrew Rodriguez (82) as Utah State hosts BYU, NCAA football in Logan, Saturday November 28, 2015. BYU defensive back Michael Shelton wasn’t supposed to talk to the media after the Cougars practiced on Tuesday night. No reporters asked for an interview with the fifth-year senior. But after a couple of players who were requested were not available, BYU’s sports information staff pulled Shelton out of the locker room to talk to some media members — myself not included — who were still there. My guess is BYU officials are probably wishing their people had found someone else. When asked by Jared Lloyd of the Provo Daily Herald a rather innocuous question about why the Cougars have a better road record than home record this season, Shelton unleashed some pent-up frustration. That came after Shelton claimed to have forgotten who the Cougars are playing this week. So the group interview was off to a disingenuous start. Sean Walker of KSL.com tried to give Shelton an out by asking if he really liked to be hated during road games, but the cornerback didn’t take the parachute. My take: It was refreshing to hear a student-athlete speak his mind. Shelton, one of the friendliest players on the team, has never turned down an interview request in the five seasons he’s been in Provo. That deserves respect. But he’s also one of the most emotional players on the team, and he let those emotions get the best of him. It’s never a good look to criticize the fans who invest good money and time into the program, especially after a loss. A subtle dig at the thousands of fans — and a large portion of the ROC — who stayed away on a picture-perfect Saturday afternoon in Provo may have been warranted. But complaining about the atmosphere when the home team gave fans precious little to get excited about for the third time in four home games? That’s uncalled for. Shelton’s timing couldn’t have been worse. Before Shelton spouted off Tuesday, BYU coach Kalani Sitake was asked about the relatively low turnout for Saturday’s game. Announced attendance was around 51,000, but actual attendance was probably closer to 40,000. 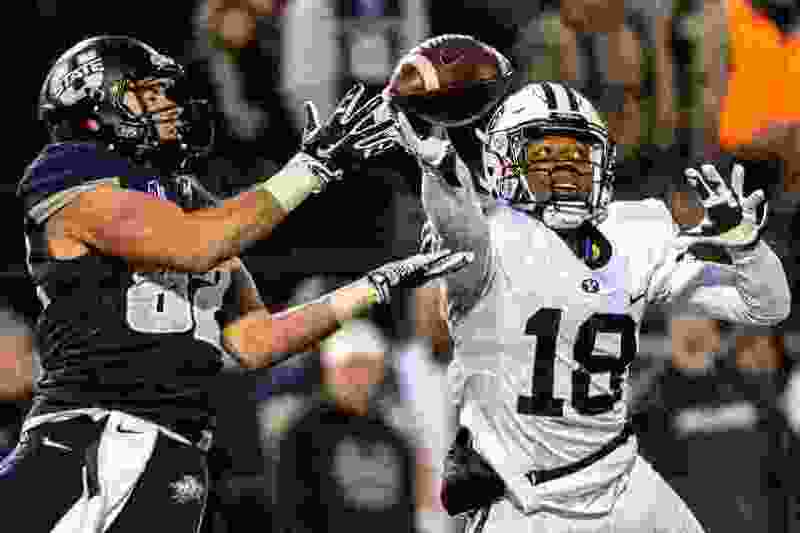 • BYU defensive back and special teams standout Gavin Fowler is one of 69 players nominated from around the country for the 2018 Burlsworth Trophy. The award is given to the most outstanding football player in the Football Bowl Subdivision (FCS) who began his career as a walk-on. A senior, Fowler has been BYU’s holder the past two seasons and has also played on the kickoff and punt cover teams. • BYU’s men’s basketball team tunes up for Tuesday’s season-opening showdown at No. 7 Nevada with a final exhibition game against Westminster College on Thursday night at the Marriott Center. Freshman forward Kolby Lee is expected to play after missing the 92-71 win over Saint Martin’s last week with a sore foot. • BYU’s women’s soccer team clinched the West Coast Conference’s automatic bid for the NCAA Tournament with a 2-0 upset win over No. 6 Santa Clara on Saturday at South Field in Provo. The Cougars (12-4-1, 7-1 WCC) play at Loyola Marymount this Saturday and will learn their NCAA Tournament seed and destination on Sunday during the Selection Show. • BYU golfer Peter Kuest tied the lowest three-round score in school history, a 16-under-par 197, to win the Visit Stockton Pacific Invitational golf tournament last week. It was Kuest’s second victory of the season. The Cougars placed second as a team. • BYU’s No. 1-ranked women’s volleyball team (22-0, 12-0 WCC) will host second-place San Diego on Friday at the Smith Fieldhouse. The Cougars probably need to finish running the table to get a top four seed for the NCAA Tournament and the right to host first and second-weekend matches.